A Chelmsford Conservatory To Be Proud Of. 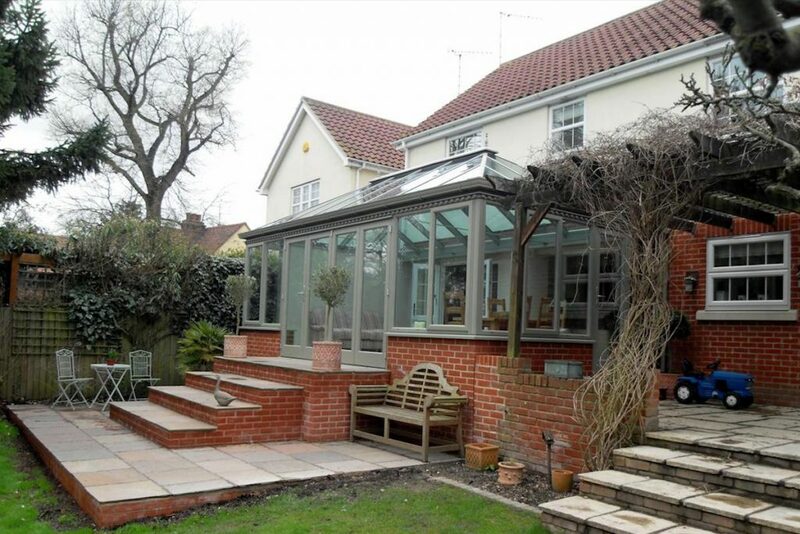 Building an extension to match in with existing features an owner wants to keep can be a challenge as we discovered when we first visited a Chelmsford property. The house was set substantially higher than the garden level and an existing pergola ran the entire length of an elevated patio. The owners wanted to keep as much of the pergola as possible while creating a glass room that could be accessed directly from the house. And it wasn’t only the pergola they wanted to keep. As you can see in the photo below, an old Wisteria vine had been growing for many years across the pergola and it was important to ensure that this was not destroyed in the building process. We also needed to provide comfortable access to the garden in a way that was not only attractive and easy to navigate but that would also provide a spot to sit and enjoy the outdoors. 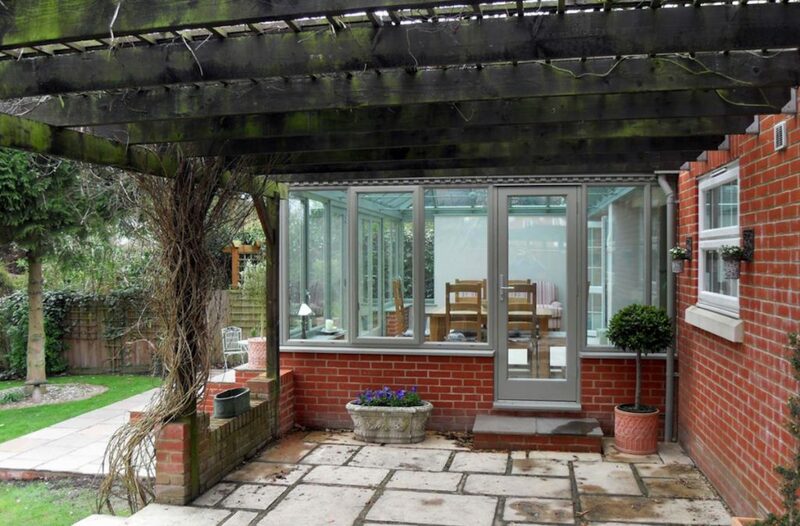 Building a conservatory to match the home’s floor level meant that one metre base walls would need to be constructed leaving a big expanse of brick on display. These were disguised by siting a Lutyens bench on one side of the new steps and planting in pots on the other. A delicate iron cafe set were placed on the lower platform to not only provide a space to sit but to balance the proportions of what is in effect a very deep set of steps. The owners wanted some traditional detailing which was provided by designing and building a hardwood hip roofed conservatory. Dental moulding was added above the windows and doors and a four leaf set of full height folding doors open directly to the garden. 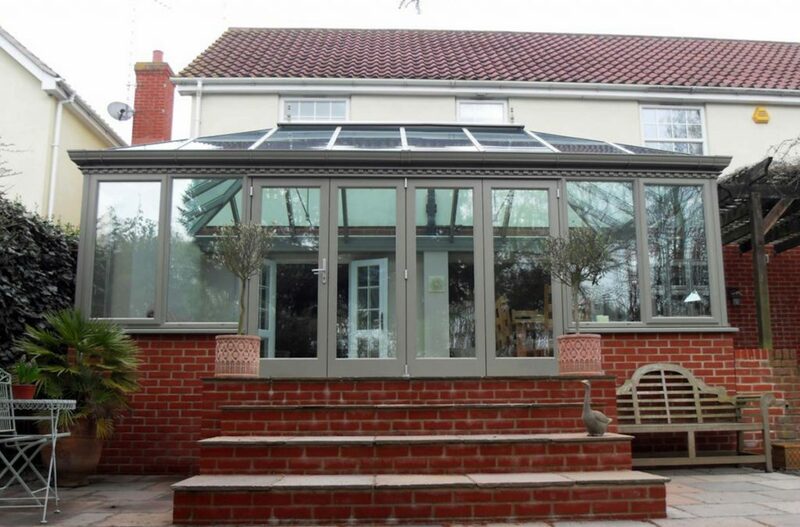 The colour choice of a mid grey worked perfectly with the existing pergola which had weathered with age. 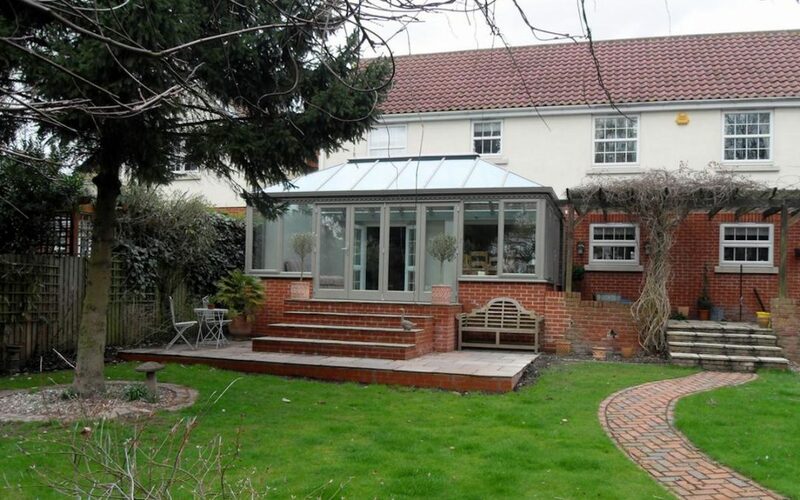 This Chemsford conservatory is large and is accessed by two of the rooms in the house beyond making it the perfect spot to allow family and guests alike to enjoy the spacious, light and airy extension. An additional single door was added to the side of the conservatory so that the family could utilise the existing patio space beneath the wonderful old Wisteria. What started out as a bit of a challenge, has become a fabulous space that’s a huge success!